EAP Statue at My Alma Mater, Univ of Balt. . Wallpaper and background images in the Edgar Allan Poe club tagged: poe eap edgar allan poe baltimore poe statue ub university of baltimore. It's said that Poe's stance -- leaning forward, with his left hand raised -- indicates that he was listening to ethereal music. Funny, the first time I saw the statue, I thought he looked as though he was about to barf! 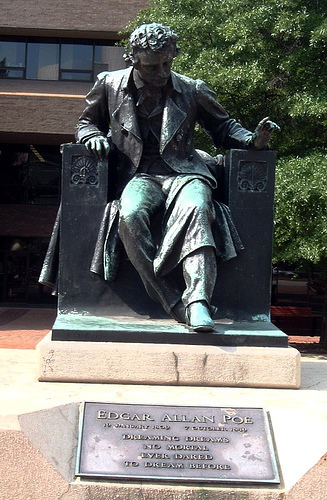 As a student at University of Baltimore, I walked many a step back and forth in front of his perch on Gordon Plaza. it's beautiful!!!! i didn't know there is an statue of him! great! i love him!! :) he's the best writter ever!! Funny, I thought he was about to throw-up, when I first saw this. This is the best photographic capture of this statue that I have seen. Excellent and thanks for sharing with us.